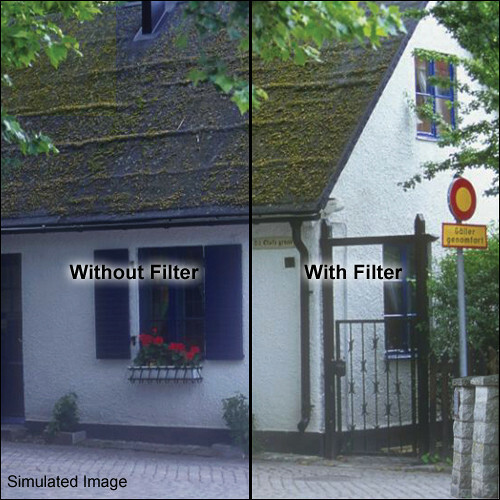 The Formatt 3 x 3" 85 Color Conversion Filter will produce natural colors when shooting with tungsten film outdoors. What do you do when you must take some photos outdoors and all you have left is tungsten film? Using tungsten film in daylight will produce a bluish cast in the photograph. The 85 series of filters will "bring back", i.e. color balance the tones in your images. These yellow filters are used to correct differences in color temperature between the recording medium (film/video) and the light source. It should be noted that an 85 filter produces slightly cooler results than an 85B (with tungsten film in daylight) whereas an 85B converts tungsten film to daylight. The 85C produces the coolest results - more than either the 85 or 85B. However, it is interesting to remember that an 85C is also useful as a creative warming filter with daylight film in daylight.